The Viper SmartStart app has been improved. Besides starting, tracking and controlling your car from your smartphone, the app now adds control of your home alarm. This is accomplished by adding a toggle switch that allows you to go back and forth between car and home control. When switched to the home setting, the user can turn on or off their home alarm with one quick touch of a smartphone. 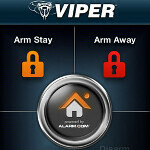 The Viper SmartStart app is available for free from the App Store, Android Market and BlackBerry App World. Those who have already installed the app need to update to version 2.2 to get the home alarm features. And there is one last thing. You must have an Alarm.com enabled home security system for the app to work. The company behind the application has also just launched Viper SmartStart GPS which not only lets you control, track and locate a car using your smartphone, it also adds social networking and other safety functions. Ooops...I meant the 6th one.